We are so excited to finally be able to announce that Braeden is one of five national finalists for the General Mills Feeding Better Futures Scholar Program. 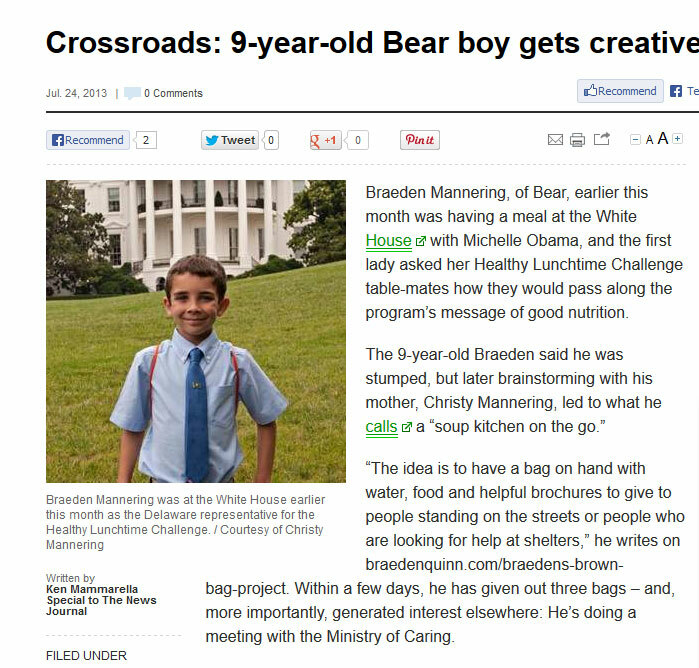 As a finalist he has an opportunity to win $50,000 for 3B Brae’s Brown Bags. 3B is a small nonprofit so this prize would go a very long way in helping us sustain our mission. Packing a brown bag is simple, but ensuring that the food is healthy is not as simple due to affordability, accessibility and shelf life. Further, making sure those bags reach the people who need them most is a challenge, fortunately Braeden doesn’t turn away from challenges. The video shares a little bit about the 3B mission of improving nutritional security, in part by getting youth involved in the solution. Winning the contest would help us to reach and feed more people in need. It will be easier to grow our 3B Ripples program with schools and youth organization. We are also happy to assist with natural disaster relief across the country. 3B has been able to provide bags after wildfires, hurricanes, and flooding in several states. Anyone can vote on the videos that were produced and we need YOUR help to get Braeden votes. You can vote daily, at FeedingBetterFutures.com from now until May 15. Forward this email and share on your social media pages. Remember to tell your friends and family. 3B relies solely on donations and youth grants to sustain our nonprofit, we do not receive federal or state funding. We would like to extend our sincere thanks to the Delaware FFA for yet again choosing 3B Brae’s Brown Bags to be a service project during their statewide convention in Dover last week. Their convention is meant to span three days. However, this year due to a snow storm, they ended up cramming LOT of activities into just one day! Fortunately, they still made time to pack bags of healthy food for those in need in the Kent County area and we are incredibly grateful. Amanda Powell, Executive Secretary of the Delaware FFA Association, let us know that the FFA students packed 270 bags. They have also already delivered 110 bags to the Salvation Army and 160 bags to Peoples Place both in Dover, Delaware. PLUS they plan on packing EVEN more bags in the near future! The Delaware FFA students never cease to amaze us with their dedication and leadership. They are proof that when we all work together, we can make a big difference! While Braeden and I ended 2016 with the flu and pneumonia, we were able to begin 2017 feeling MUCH better and hopeful for a bright new year. Braeden tweeted on New Years saying, “This year let your light shine! Make the choice to believe that 2017 is going to be amazing.” I absolutely love that sentiment. Way to go, Brae! My other two kids, Finn and Amelia, were able to help me deliver 3B bags to Calvary Baptist Church on Christmas Eve which has become an annual Christmas tradition for us since we started 3B. We provided bags for all of the homeless guests who partook in their Christmas Eve festivities. Thanks to my Aunt Mares we were also able to provide hats, scarves and gloves. While Brae was sick my sweet Finn really stepped up. At first he didn’t want to leave his Google Santa Tracker, but when I explained that tracking the houses Santa stops at is fun to do. but not everyone has a house. So for those people we get to be Santa! He put on his Santa hat immediately and was ready to go! It feels so good to be able to play Santa every now and then. MOT Charter invited Braeden to speak to the 2nd and 3rd graders a few days before Christmas (when he was still healthy). We are absolutely amazed and humbled to report they packed 426 bags! They also donated a car load of books and healthy snacks for us to use in making additional bags. When we initially walked into the school one of the first things we saw was a showcase that featured Braeden! Of course I had him stand near it so I could take a picture, but honestly, normally you see trophies in cases like this and to see 3B featured felt pretty incredible. The showcase was titled “The Power of One” and it inside were pictures of Brae’s last visit to MOT Charter as well as quotes printed out from Brae’s talk. It definitely helped both of us to feel even more inspired that day. And to see all the great work MOT Charter has done in helping to provide healthy food to those in need in their community via Our Daily Bread and with help from the Jefferson Awards Foundation. Less than a week prior to the MOT Charter visit we received word that our 3B Ripple at Caravel Academy packed 131 bags! We were able to use some of those bags on Christmas Eve for those in need! The generosity and compassion I see in these young students overwhelms me with joy. I know it means a great deal to Braeden as well. When he is invited to speak at a school he is always very excited to hear that the kids will ask him after his talk. And as his Mom, I love being able to see him interact with youth and empower them to be involved in what he is doing, but also to dream big with their own ideas on how they can help their community. So we hope that you all had a very Merry Christmas and happy holidays! We also wish you a new year filled with happiness, love and laughter. Be the light in the world, be the change! My apologies for taking so long to write this post. Things get away from me and from Braeden sometimes. During the celebration, Brae said something that I would like to share for those who were unable to attend. We had our 3rd Annual 3B Summer Celebration the end of August and even though it was super hot out we had a pretty great turn out. Thank you to all who came out to the Bear-Glasgow YMCA for the event. A big thanks to our sponsors this year: Bear-Glasgow YMCA, 93.7 WSTW, Crop Foundation (food and amazing culinary instructor Kip Poole and his talented students), UD Fresh to You (Michael Popovich and farm interns for providing veggies and fruit), UDairy Creamery, R.T. Graham (Keene art teacher from the Christina School District), Speakman, Inflatables R’ Fun, Love What You Boo, Del-One Federal Credit Union, Dover Federal Credit Union, Gerri and Bill Irish, Greg and Margie Mannering, Circle of Friends Daycare, Terri, Todd and Kristin Stephan, Transportation Communications Union IAM Unit #86, Stampin’ Up, Picaboo, Food for Thought Cards and Lynda Pusey with her Jamberry basket. A very special thanks to Ladder 12 of the Christiana Fire Company for surprising us and bringing two trucks out to the event. The kids, and us grown ups, really loved seeing all of the firefighters and being able to climb up on the trucks to check out all the gadgets. All of you are so awesome. We thank you for your service each and every day! Check out 3rd Annual 3B Summer Celebration by Kristin Stephan! During this event I always have an opportunity to share Brae’s adventures through my eyes. Whereas he is always busy inspiring and encouraging other people to get involved, I’m sitting back and watching this amazing young person be a leader for our community. Brae is often called a young hero. He doesn’t look at himself that way, but I definitely do. Whereas some people spent their afternoon at a movie which could potentially gross millions of dollars, our friends, family and 3B supporters came out to a pavilion for delicious food, awesome giveaways and many of them packed bags for those in need. Thank you to Sodexo employee Toni Ciccone for helping with the 3B bag packing station! And all of these things, hearing Brae talk, seeing people selflessly pack bags for those in need, being able to interact with the community and raise money for hunger relief, all of those things are absolutely priceless to me. Seeing him up on stage addressing a group of people who came out to support him and our 3B cause is something I can’t accurately put into words for you. I cannot even begin to express my gratitude to all of you for helping 3B grow and for encouraging Braeden to be the very special kid that he is. We truly live in such an amazing state! Again, please do Check out 3rd Annual 3B Summer Celebration by Kristin Stephan! Yes, she even snapped when I went down the water slide, which was super fun! Once again, thank you, from the bottom of my heart for your continued support! I went back to school today after being in Washington, DC for the last three days. I need to write a paper about my experience but I thought I’d try and tell a little bit on my blog first. As you probably know, I had the honor of going to President Obama’s last State of the Union address. Why? Well because the First Lady Michelle Obama asked me to be her guest. I know! It was a really big surprise and I was very excited, I’m still very excited. It all happened so fast and to be honest with you I’m still trying to really think about it all. At the White House in the room with the big Abraham Lincoln painting. There have been so many people who have started to follow me on social media and also here on my blog. I even got some emails from people. Most people have been so nice about everything. A lot of people have said they are inspired by what I am doing and they think I’m a special person. I have been called a hunger activist and a hunger warrior. Some people have said they felt bad because I looked so tired on TV at the State of the Union and I was, I mean I was very tired, but I was also very happy to be there. And what you didn’t get to see is that after the address I got to go in a different room and meet with the President. He shook my hand and he asked how the foundation is doing. The President and the First Lady both said they were inspired by me. I think that is very surprising. I mean I am proud of myself but I am really proud of them I really think they are great people and I am so happy I got to go to the White House again and got to go to the State of the Union. Some of the speech I didn’t really understand but there was also part where the President talked about how the US went to the moon. My Mom has said this to me before, she has said that people didn’t always believe they could go to the moon and they thought it was crazy. But then we did, we did go to the moon, we walked on the moon. I think he President was trying to say that impossible things are very possible. But I think he was also saying we need to believe in ourselves and in each other and work together. And I do that, all of us who volunteer with Brae’s Brown Bags or with other advocacy things we all do that every day. We just need more people to stand up for each other and be there for each other. We have to work together as a family and family doesn’t just have to be your Mom or your Dad it can be your friends and your neighbors. And I think he talked about equality. Because he says that everyone should be able to get a good education and have good health care and that everyone should feel they are heard. Other really nice people I got to meet were Secretary Tom Vilsack who gave me his challenge coin and talked with me about Brae’s Brown Bags and told me about he started working with the USDA. Under Secretary Kevin Concannon who talked with me about the hunger conference I co-hosted. He had been a speaker at it but he never got to see the kid part of the conference so I filled him in. And also Senator Tom Carper who told me all about being in the Navy and his family and his favorite sandwich and even chickens. Did you know Sussex County in Delaware grows the most chickens in the whole country? He took me over to the Capitol Building and I got to eat lunch there. All of the staff at all of these places were super nice and welcoming. And then a show called The Daily Show kind of made fun of the State of the Union because I guess that is what they do. I don’t really get it BUT they called me Senator Kid and when my Mom showed me a picture it was pretty funny. I admit it, I laughed. It was pretty funny to see him dance and sing Senator Kid with my tired face on the screen. Ohhhhh the stories I will be able to tell someday. And I really like Washington, DC. It is fun. I like to walk places and you don’t really get a chance to do that in Delaware. I think I might move there someday. For now, I’m going to finish playing an Xbox game with my brother and then go to bed, I have school in the morning. So I’ve been meaning to write a blog post and I know I keep saying I will write more, but you know, it gets really busy! First thing is that this is National Hunger and Homelessness Awareness Week and I think that is important to mention. And I think that maybe as we are at the end of the week you can think about how you have reached out to help someone in need. Have you packed a brown bag lately and given it to someone on the street? Let us know! And share other acts of kindness you have been able to do. Because really every little thing helps, even a friendly smile. There were two really cool events recently that I want to tell you about. Cara’s Dad, Miriam the Executive Director of K4C, Laya, Taylor and the amazing brother/sister cello players Noah and Sydney of From the Top and me, I’m sort of in the middle. The Karma for Cara Foundation has a fundraiser in Owings Mill, Maryland at Cave’s Valley Golf Club on Friday, November 13, 2015. I went with my Mom and I was asked to talk a little bit about what I am doing with Brae’s Brown Bags. Because Karma for Cara gave me one of my first see grants and that will always make me very thankful. Karma for Cara is in honor of 21-year-old Cara Becker. In 2012 Cara passed away with leukemia and because service was always important to her she has asked her family to find away to continue getting people involved in service to help others. I mean that is just really so nice! We met other people there who are also going really inspiring things in their community. Laya who helps homeless in Baltimore County by give them trail mix and trying to encourage young kids to be more aware of the homelessness. She is awesome. We also met Taylor and she has a project called “For the Love of Erica” which she started when her friend Erica died of cancer. She donates toys to children in hospitals and throws them parties! Grace Firestone, Nik Toocheck, Anegliz Merroro, Braeden Mannering (me) and our moderator Sarah Driscoll. The panel also had Grace Firestone, Nik Toocheck and Anegliz Merroro on it. So Grace has a program called “Let the Kids Play” and it’s just really, really cool. She raises money to help inner city kids get sports and be involved in sports programs at their school. And then Nik, he has a program called “Running the World for Children” and he literally RUNS THE WORLD, he has done marathons on seven different continents. He is going to run a race in every single state in the US too and you can help him accomplish this goal, so check out his website. Last but not least is Anegliz Merroro and she has taken over Instgram with her anti-bullying ideas. She shared a very sad story about a mentally challenged person being beaten up and she said people didn’t talk about it and that people need to talk about it and know it is happening so we can make it stop. So not only did I enjoy talking and presenting, but I also made new friends and I think they are doing really good things. And then to make it even more awesome they gave me an award! Caitlin Custer at the Food Bank of Delaware nominated me for a Rising Star in Youth Philanthropy and they picked me! So they showed a little clip about me and they gave me a really heavy award and it is very nice! I am so thankful for all of this, for the new friends and the new inspiration and the award, it’s really so cool and I feel very thankful and lucky! And just in case I don’t get to write again before next week, HAPPY THANKSGIVING! I am thankful for my family and friends, and I consider all of you who read this my extended set of family and friends! Quick update: Please read our post on Facebook about homeless funding being at risk in Delaware. And let us know your ideas on how we can fix this situation. Over the weekend I went with my parents into Washington, DC and North Bethesda for the STOP Hunger Scholars Celebration with the Sodexo Foundation. We took the train Sunday morning and had a dinner Sunday night and then a great big huge dinner Monday night. There were over 1,000 people there on Monday night! I met Ellie Krieger, she is a Food Network chef and has her own healthy eating TV show. She was very nice. She interviewed me up on stage along with Lorna Donatone, she is the COO of Sodexo. Five scholars across the nation were chosen for their service work pertaining to ending hunger. The Stephen J. Brady STOP Hunger Scholars receive a $5,000 scholarship for their education as well as a matching grant for the hunger charity of their choice. So very generous! We all shared our #EndingHunger dreams and this was mine, that everyone would have access to healthy food and clean water regardless of their financial situation. Make sure you download your own selfie sign so you can share your big dream for ending hunger. I think everyone who attended the dinner and the other four scholars all feel the same way. It was so nice to meet everyone. Amazing people with BIG dreams who are doing really awesome things. The Sodexo Foundation, and their pal Corey, created a super awesome video where all five scholars got to say hi to each other and talk about what they are doing in their communities to help end hunger and provide hunger relief. To Sophie Bernstein, Caroline Ford, Kylee McCumber and Isaac McFarland, I’m so humbled to have met you and very proud to call you my friends. The couple days I had in Washington, DC were just so fun. And the people at the Marriot were SO NICE TO US! They brought us mints, three mints every day. Their pool was so nice, I loved it, I wish i could have gone and swam for longer. The woman who checked us in asked about Brae’s Brown Bags and she was so emotional when I told her and my Mom ended up giving her a hug later because she kept apologizing for crying. I’m feeling pretty lucky about everything. The whole Flickr photo album is available for everyone to look through, too. Thank you, thank you, everyone! Me and my family went to Fenwick Island for a week. It was a lot of fun. I got really good at boogie boarding. Me and Finn (my 4-year-old brother) found a lot of seashells and they weren’t broken ones either. It was a really good week. We stayed at a house with my Grandmom and Grandpop. My Aunt Kristin and Uncle Ben were there for a few days, too. It was Amelia’s first time at the beach. She ate some sand. She didn’t really like the cold water but she seemed to like the beach. My Daddy Brian and my Mom helped build moats and sandcastles. My Mom has a bunch of pictures she said she will help me put one on here. While we were at the beach my Gram and Pop Pop let me know my article was published in The News Journal. A couple of weeks ago I did a phone interview with Ken Mammarella and the article he wrote was published in the Crossroads section of The News Journal on Thursday, July 25th. Or you can download the PDF version here if the link stops working. I talked to the reporter about the 2013 Healthy Lunchtime Challenge and how would it was to be the winner for Delaware. I also told him about 3B, Brae’s Brown Bags. My Mom shared the story on Facebook and she said some of the other winners from the challenge are going to hand out Brae’s Brown Bags, too. I’m very happy to hear about that. I hope they do share bags with homeless people who need them. When I get a chance I will share pictures from the beach, too. Yes, yes I know I forgot to tell you about the actual recipe that made me be able to go to The White House. It’s a taco bowl, well, I called it the Tortilla Bowl Deluxe. I really like tacos but they don’t hold much and they are really messy. So if you use a taco bowl then you can make it yourself and it will hold more. To make a recipe that kids would like to eat at lunch I wanted it to be fun. It’s also colorful because I used a lot of different color vegetables. So first you need grilled chicken strips. I can’t have things with too much spices because it will upset my stomach. I have a fructose and lactose intolerance and tummy problems. So my chicken is just salt, pepper and lemon juice. So chicken strips and then you add diced tomatoes (I can only eat tomatoes in moderation so I can’t have many in my bowl), orange sweet pepper diced, avocado diced and sprinkled with grated Monterrey jack cheese (Lactose free). You can add salt and pepper if you want. Then on the side you should have fruit because that means you have had all the food groups on the My Plate. I chose pineapples and cantaloupe. I can’t have grapes and watermelon because they have too much fructose but I really wish I could have them, too. So that is the recipe that helps me to in the Healthy Lunchtime Challenge. 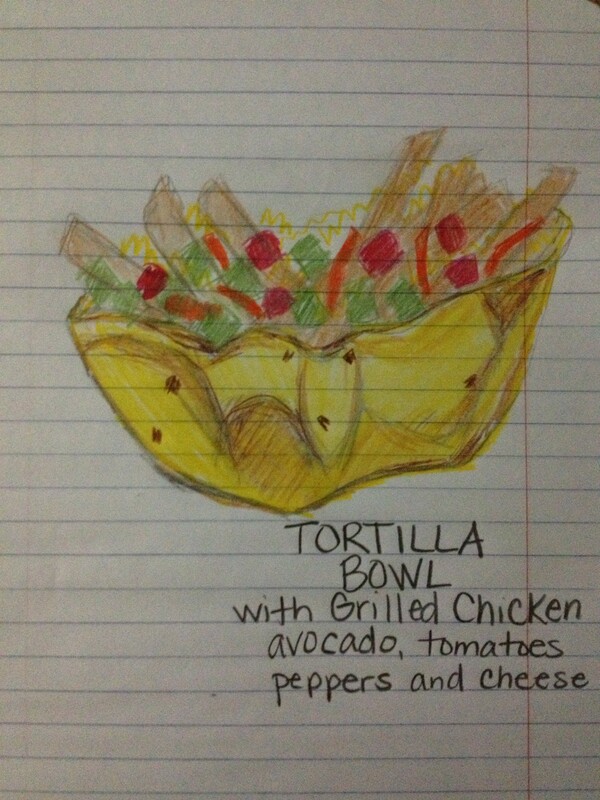 Official Tortilla Bowl Deluxe Recipe link. 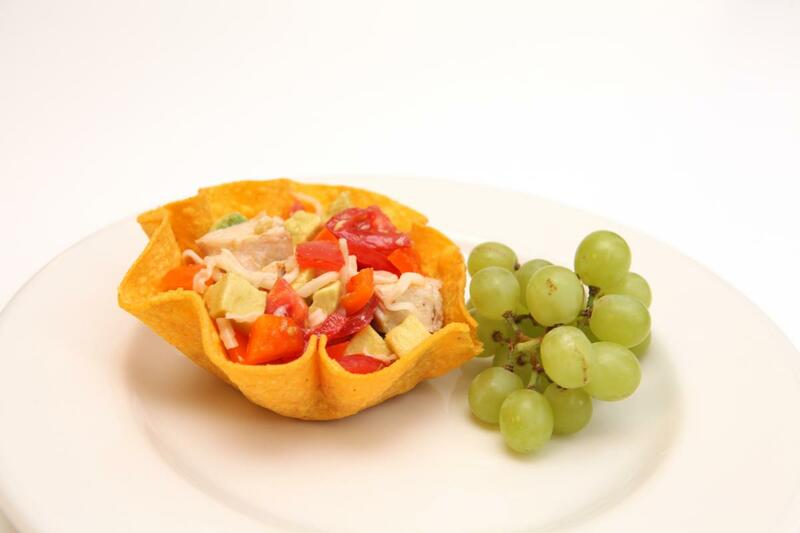 For the complete 2013 Healthy Lunchtime Challenge Cookbook, click here. Tomorrow I am going to get on a train and go to Washington, D.C. I have never been on a train before and I’m really excited. I created a healthy recipe for the Healthy Lunchtime Challenge and my recipe won. There were 1,300 recipes and 54 were selected as winners. All the winners and one parent will attend the Kids’ State Dinner at The White House on July 9, 2013. My picture is in the top right corner of the cookbook.